Obituary for Deanna Jean (Crist) Wichman | Schaffer Funeral Home, Inc.
Deanna Jean Wichman, 78, of Defiance, passed away on Saturday December 1, 2018 at CHP Defiance Area Inpatient Hospice Center. She was born on August 2, 1940 to Clarence and Elda (Riebesehl) Crist in Defiance. Deanna worked for Campbell Soup Company in Napoleon for over 19 years, retiring in 1997. On January 14, 1957 she married Allen Wichman, who resides in Defiance. Deanna was a member of St. John Lutheran Church in Defiance, and was a former member of the Ladies Aid Society. She was a member of White Pines Golf Course, and former member of Auglaize Golf Course. In her leisure time she enjoyed golf, mowing, flowers, reading, feeding the birds, and watching the squirrels and deer. 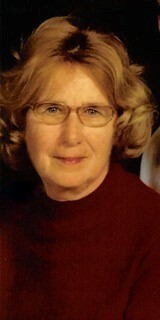 Her greatest joy was spending time with her grandchildren and great-grandchildren, and attending their sporting events. Deanna is survived by her loving husband of 61years Allen Wichman of Defiance, daughters Sherry Ott of Beaver Creek, OH, Amy (Stan) Guilliam of Ft. Wayne, IN, and Kim (George) Kruse of O'Fallon, IL; six grandchildren, Jason R. Guilliam of Oviedo, FL, Cassandra Kuhn of Ft. Wayne, IN, George Allen Kruse of Highland, IL, April Bingheim of Belleville, IL, Christopher Kruse of O'Fallon, IL, and Kyle Ott of Xenia, OH; 14 great-grandchildren, Benjamin, Katelyn and Lucas Guilliam, Rylan, Jackson, and Olivia Kuhn, George Robin, Tucker, and Elliott Kruse, Camden and Madison Bingheim, Gabriel Kruse, and Ainsley and Ava Ott; and one brother Dale (Sue) Crist. Visitation will be held from 9:00 to 11:00 am on Saturday, December 8, 2018 at St. John Lutheran Church in Defiance, with a Memorial Service following at 11:00 am, with Rev. Donald L. Luhring officiating. In lieu of flowers, memorials may be made to CHP Defiance Area Inpatient Hospice Center, GiGi's Playhouse Ft. Wayne (Down Syndrome Achievement Center) or St. John Lutheran Church. Online condolences may be given at www.Schafferfh.com.